Dividing a large room into two smaller rooms may not be an option if you're renting, or if you don't want to make a permanent change to your home. You can work around this problem by building a freestanding room divider. This is a U-shaped wall constructed of 2-by-4 framing and covered in drywall, which can create a barrier in one area of a room without permanently altering the layout of your home. 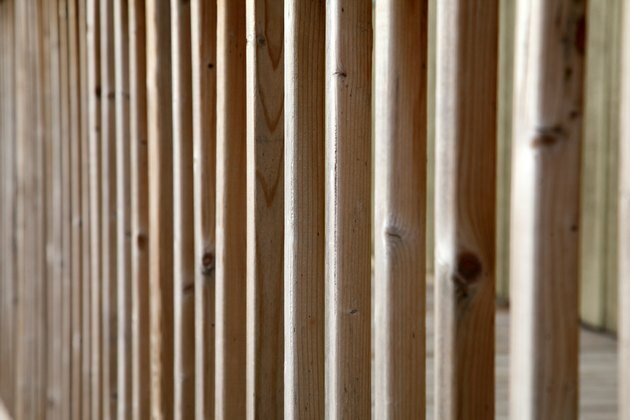 The 2-by-4 boards are key components of a freestanding room divider. Measure the area where you want to place the room divider, and sketch out the design of the divider. 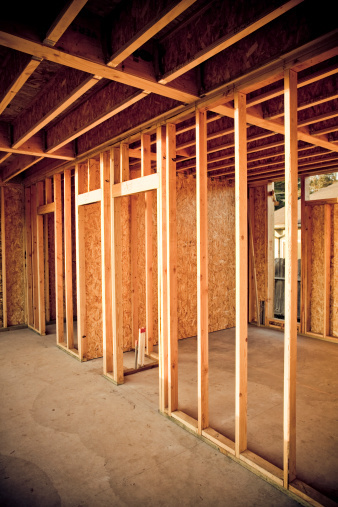 In a U-shaped divider, for example, the framing for the main wall and the two side walls will be constructed separately, then assembled before the drywall is installed. Cut 2-by-4 boards to be the top and bottom plates of the side walls. These boards match the intended length of the side walls. Use one top plate and one bottom plate for each wall. Cut 2-by-4 boards for the studs that match the intended height of the divider. Cut enough studs so they can be spaced no more than 16 inches apart. Nail a stud into each edge of one of the bottom plates. These are the end studs. Nail more studs into the bottom plate between the two end studs, keeping them spaced no more than 16 inches apart, then nail the top plate to the top of the studs. Construct the second side wall and the main wall of the divider, using the same process you used when building the first side wall. Stand the main wall of the divider and one of the side walls on their bottom plates, and place them together to form the shape of the letter "L." Nail the end studs of the two wall sections together where they come into contact. Connect the second side wall to the main wall, forming the shape of the letter "U." Measure and cut 1/2-inch drywall to fit the sides and top of the framing. Screw the drywall to the framing with drywall screws, using one screw every 16 inches. When installing the screws, drive the screw heads deep enough so they penetrate just beneath the surface of the drywall. Staple metal corner beads to the edges of the divider where the different surfaces meet. Apply joint compound to the joints between different sheets of drywall and over the metal corner beads. Place drywall tape over the joint compound, then press the tape into the compound with a putty knife. Allow the joint compound to dry overnight. Sand the joint compound smooth, then wipe the dust off with a rag. Add a second layer of joint compound and drywall tape to the divider, and allow it to dry overnight. Sand the joints smooth again, then apply a third layer of joint compound and drywall tape. Allow the joint compound to dry overnight. Cover the divider with a coat of primer, and allow it to dry. Apply two coats of paint to the divider, allowing each coat to dry. Nail baseboard trim to the bottom of the divider.